This was a show of many highlights. Two gifted songwriters answering a call to destiny while determine to overcome the perils of life’s obstacles. They both possess the burning desire to share their experiences, observations and feelings. Perhaps song writing and performing is a form of therapy that finds a willing audience ready to finance a journey through words and music. Whatever connects an articulate performer and active listener was prevalent in the Kitchen Garden Café this evening. 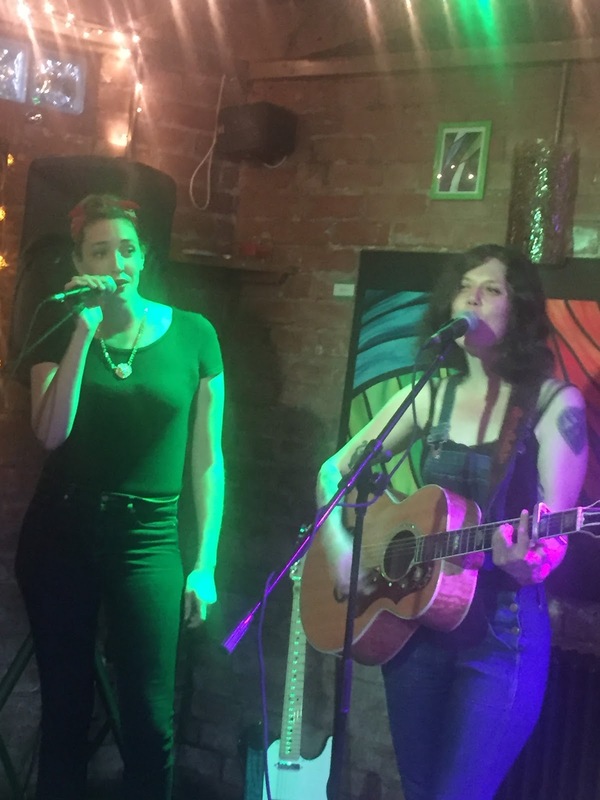 Hannah Aldridge and Lilly Hiatt play music of the soul in a way that captivates a tuned-in audience leaving a trail of awe, satisfaction and belief that straight from the gut music is full of intense appeal. Poignant moments endlessly flowed from a show that inevitably adopted a shared platform feel. 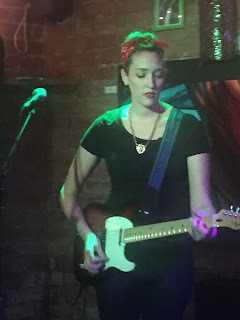 The overseas touring experience, vocal presence and dominant poise edged Hannah in the billing stakes, yet Lilly wasted little time in stripping back the tracks of a brand new album to reveal a song writer of supreme talent. Together they ironically united for a rendition of Lilly’s ‘Somebody’s Daughter’ and jointly celebrated the work of a hero when spilling out a version of Gillian Welch’s ‘Look at Miss Ohio’. Those were key moments for starters as both individual sets hit on common themes akin with the deep feelings of a lyricist. Two songs continually wrestle with the strong emotions of the listener when Hannah Aldridge hits town. ‘Black and White’ evokes a tough bond between mother and son with an inner strength surfacing amongst a superlative melody. ‘Parchman’ may have a third person origin, but is written and performed so entwined in character that it leaves a convincing impression. 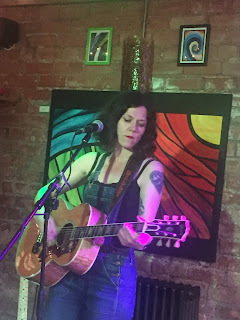 Not to be outdone in the melody stakes, Lilly Hiatt’s ‘Royal Blue’ regally makes a golden journey from performer to listener, while ‘Get This Right’ successfully finds an acoustic home in the absence of a full band accompaniment. Similarities are aplenty between these two singer-songwriters and not just the wisely underplayed genetic heritage. They’re both soaked to the bone in Southern writing folklore and seemingly possess an independent spirit to find their own answers. From a Nashville base they strike out to a lot of places east, west and south, fuelled by travel, history and context. Life’s travails are turned into song writing positives and they’re both embedded in the spirit of Americana. The contrasts are not limited to a visual observation and use of vocals. Lilly has successfully released a new album which is currently having a European renewal, while Hannah’s determination to follow up her well-received debut record is about to enter the final stages of fruition.The increased familiarity of Hannah’s unreleased new songs only adds to the anticipation of their status being updated, especially as they’ve been previewed on repeat occasions. The full band treatment and slight rock direction of them will shed more light on Hannah’s ability to ease through the styles of the South. Lilly has grasped this opportunity to join Hannah on tour with suggested relish. Her story telling mark has been left on the calling cards of being stranded in Texarkana during ‘3 Days’ and the relaxed nature of introducing ‘Jesus Would’ve Let Me Pick the Restaurant’ in Europe. There is an optimism that this transatlantic arrangement can flourish in the foreseeable future. It is probably fitting to leave the final words with Hannah who has made such a defined impression with European audiences over the last two years. Tonight’s unplugged version of ‘Howling Bones’ was another successful attempt to connect with an intimate crowd eager to buy into her take on art. However it was her description of ‘pouring out your guts music’ which resonated strongly and, that proverbial nail may just have had its final hammer blow.